When we talk about making museums or performing arts organizations more participatory and dynamic, those changes are often seen as threatening to the traditional arts experience. Audience commentary, comfortable spaces for eating and talking, opportunities for amateurs to contribute to professional work: these are often considered intrusions into formal, classical settings for enjoyment of arts. But what if the "traditional" arts experiences is a myth? What if historic arts experiences were actually a lot more participatory? This week, I read a fabulous essay that made me feel a new kinship with the past in the quest to advocate for active audience engagement. In In and Out of the Dark [pdf], Colby College professor Lynne Conner argues convincingly that the current refinement of the Western fine arts experience is an aberrant blip in a long history of participatory audience engagement. From the Ancient Greeks through the 1800s, audiences were rowdy, engaged people. They had the freedom--and in some cases, the obligation--to make their own meaning and share their interpretations of art with each other in structured and informal ways. They voted on the best plays in the days of Sophocles, stormed the symphony halls when confronted with artistic dischord, and talked and wrote about what they saw and what they thought. If arts managers fear bloggers today, imagine how they would have felt back in the good old days when the audience was yelling and throwing things at the stage. Conner posits that it was only in the last hundred years that the passive audience was "constructed" via a confluence of cultural, economic, and technological changes. From Conner's perspective, this construction has led us to a bifurcated cultural landscape, in which people seek out active audience experiences outside of the fine arts structure because the passive audience experience is not as satisfying or enjoyable as the alternatives. Conner argues that open mics, poetry slams, even professional sports events, are thriving because they offer audiences diverse opportunities to co-author meaning as participants, not just consumers. What exactly constructed the passive arts audience? The big cultural shift came in the increasing distinction between highbrow and lowbrow art, which Conner describes as "the result of a deliberate effort to create a cultural hierarchy in America." The arts were sacralized and professionalized in their funding and presentation. Museums no longer showed human horns alongside historic documents; theaters made differentiations among types of live entertainment. Arts institutions began publishing instructive placards and documents to train audiences to behave more formally and to treat artists and artworks with silent respect. Proper audiences were like docile children, seen and not heard. Eventually the combination of environmental forces (i.e., the dark auditorium and mandated etiquette) and the growing gap between the societal position of the artist and the arts patron effectively quieted the audience. By the early twentieth century people of all social classes were expected to treat arts events as private experiences. They were to sit still, to refrain from talking, and to keep their opinions to themselves. In the process opportunities for public discourse about the arts and the attendant opportunity for formulating and exchanging sets of opinions about the arts event itself were, for the most part, lost. This perspective--that audiences were "silenced" during the past 100 years--creates a new kind of arsenal for those who support democratization and increased audience participation in the arts. We are honoring the deep history of serious arts engagement by pursuing participatory approaches. You could even argue that the "activist" conservatism of the past hundred years has done disturbing damage to the sharing, experiencing, and support of art in the U.S. In a time of intense socio-economic division, the concept of cultural hierarchy smacks of elitism. Arts organizations are seen as part of the 1% instead of forums to bring together 100%. Perhaps it's time to turn back the clock a little further when we talk about the good old days. P.S. Lynne Conner has a book coming out next year called We the Audience. I can't wait. And thank you to Lauren Shultz, who introduced me to this article in a recent Museum 2.0 comment thread. I promise--after this post, I'll stop writing about this. But we've just compiled all our attendance data for the past year at the Santa Cruz Museum of Art & History (our fiscal year ends on June 30), and several people have written to me asking for the numbers behind our turnaround. I'm in no way suggesting this is the best or only way to get more people involved in an institution--it's just the way that we did it. 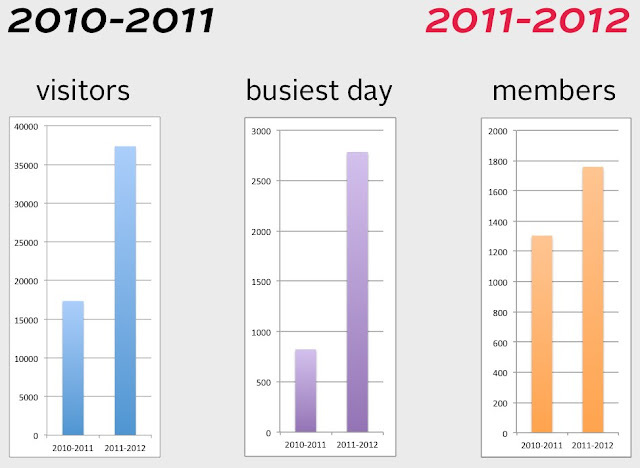 Here is the growth in our attendance, busiest day, and membership from last year to this year. These rose by 115%, 240%, and 30% respectively. The busiest day in both 2011 and 2012 is our longtime community program, Free First Friday. Now, here's our attendance breakdown for the year that just ended. Of the 37,361 visitors who attended, 63% came for a community program/event. 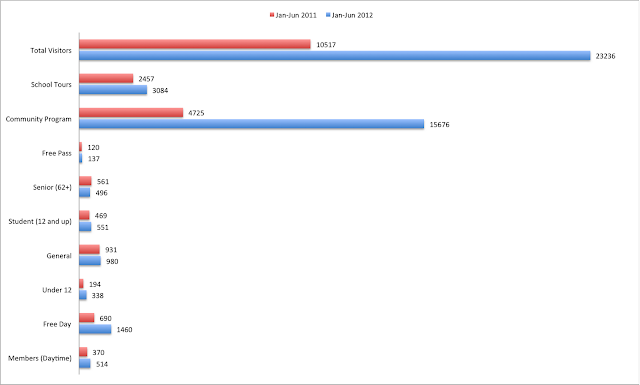 And finally, and perhaps most interestingly, here's a comparison of Jan-June 2011 vs Jan-June 2012. I'd like to show you the data for the full fiscal year, but we only have this daily data beginning in the winter of 2011. You can see here that 86% of our growth in attendance from 2011 to 2012 is due to community programs. partnered with local artists and community organizations whose passion and generosity made it possible for us to create incredible events. Over 800 people volunteered their talents to support our programs, with the majority collaborating on our monthly themed 3rd Friday events. These include community arts groups, social service agencies, environmental groups, social clubs, and many inspiring individuals whom we can't thank enough. These collaborators brought their own audiences along with their abilities, which introduced a lot of new people to the museum. actively sought out community needs to respond to. We tried with every event to meet a clearly-expressed demand or interest in the community. People wanted a fire festival, so we did a fire festival. People love crafting, so we created Radical Craft Night. Sometimes the interests were overt, and sometimes they were something we sensed in the wind. But we tried never to create an event without partners or audiences who were invested in what we were making. focused on specific audiences and consistent time slots. We created programming specifically targeted to families with young kids and adults looking for casual, intriguing, affordable cultural experiences on Friday nights and Saturdays. Now Friday nights at the museum have become something people can count on, and they keep growing. were shamelessly resourceful. Our program budgets are typically under $100. A big festival with 50 collaborators and 1,000 visitors might rate a $250 budget. We get materials donated from our members, we put up our own flyers around town, and we have a great working relationship with the city dump. Now that we're in a better financial position, we do plan to increase budgets a bit, but we want to spend any additional money supporting our artist collaborators, not on extra materials. diversify our programming by offering more intimate events alongside the big festivals. We have increased to being open late every Friday, but we will continue to only have big events (500+ visitors) on the 1st and 3rd Fridays. The other Fridays will be for more singular workshops, talks, and performances. The same is true for Saturdays, where we will continue to have a monthly formal family art workshop but add in drop-in programming on the other weekends. find ways to financially support our program collaborators. We realize that asking people to volunteer their talents is not always respectful of their time or skills. At the same time, our programs' success is based on the cross-pollination of professional and amateur collaborators, all of whom bring different needs and expectations to the table. We're working on providing paying opportunities for collaborators that are equitable and flexible enough to accomodate the diversity of our partnerships. design new programs with a focus on history. Many of our events in the past year have fallen more heavily on the art side of the ledger, and as a museum of art AND history, we want to make sure we're reflecting the breadth of Santa Cruz culture. We've been toying with a participatory future-casting program and or a storytelling series to start moving in this direction. develop a system for tracking and rewarding repeat participation. Right now, all we do is count people. We know anecdotally that people tend to attend two events and then become a member on their third visit, but we don't REALLY know what's inducing people to come, come back, join, and renew. We're looking for low-cost ways to do this given our small size and community-driven character. More on that soon. I hope this data is useful to you. I'm happy to answer any questions you might have. I get excited about a lot of things in my work at the Santa Cruz Museum of Art & History. But every once in awhile, something extraordinary comes up, something that isn't emergent or evolving or encouraging but something that explodes into your life like a comet knocking on your door. That's how I felt when artist Ze Frank got in touch to talk about a potential museum exhibition to explore a physical site/substantiation for his current online video project, A Show (see minute 2:20, above). And to cut to the end of the story first, yes, we are creating a project together, yes, you can participate, and yes to whatever other questions this brings up in your head. Ze Frank is a participatory artist who creates digital projects that are explicitly about creating and enhancing authentic interpersonal connections. He is an authoritative artist of the social web with a slew of accolades and a suite of diverse projects under his belt. This 2010 TED talk is a good introduction if you haven't experienced his work before. Ze is a skilled performer, but more importantly, he's a thoughtful ringleader for a series of intricate games, missions, and provocations that invite participants to bridge social barriers in surprising ways. He invites participants to write songs for each other about dealing with rejection. To recreate childhood photographs. To celebrate political differences. To dress up their vacuum cleaners. Ze's work can feel silly or strange. It's often intended for an audience that I only barely understand through the ways they respond and interact with the work. In other words: I have a lot to learn from him. This winter, as part of a museumwide exhibition called Work in Progress, Ze and the virtual army of participants in A Show will take over a gallery of the Santa Cruz Museum of Art & History. We will be displaying products created by the online community, creating a process for ongoing online and onsite collaboration, and providing a gathering space for people connected to each other through Ze's digital universe. And on a conceptual level, we'll be exploring questions of how online and onsite participation interrelate and what their babies look like. Our values are aligned. Ze genuinely cares about his participants, and he is driven to design interactions that inspire real moments of intimacy. His projects are rigorous, sincere, and generous. As someone with a keen interest in designing exhibits that engage strangers meaningfully with each other around objects, I'm thrilled to work with a pioneer on this in a different context. Ze's work has always gone beyond the digital. Photography, video, audio, text, origami, mail art... These projects don't only "work" on a screen. We won't just be "printing out" the experience. It will be exciting to play with a gallery space because the work is multi-dimensional physically as well as conceptually. The scale and scope of participation in A Show is extraordinary. Most of the participatory projects I've been involved with are rooted in a community that is geographically-defined. Ze's community is worldwide people who self-select to engage with strangers online. This isn't a group I know a lot about, and we're all curious about how they will intersect with our local audience and with each other. It offers unique opportunities for learning more about participation. How will this partnership influence the way we think about other participatory experiences in our institution? How will it change the way we see online and onsite interactions? What constraints and surprises will emerge? I'd love to find a grad student or two who are interested in creating some interesting research around this project, and of course, I'll be blogging about it. We don't have a lot of details at this point about the specifics of the project, but here's what we do know. The exhibition will run from December 14, 2012 to March 4 of 2013. Ze will be in Santa Cruz for some but not all of that time. We will be looking for interns and volunteers who want to help facilitate the space throughout the winter--please contact me if interested. And copious thanks to Eric Siegel, who introduced Ze and me to each other. Most importantly, I'm curious: what would you like to see us explore with this exhibition? You know those times when you are looking for a blog that provides you with meaty analysis on contemporary issues in arts engagement? When you wish for bloggers who were willing to write 2,000 words instead of 200? When you want someone rooted in both the business and art worlds? When you want cogent arguments with charts to back them up? Stop looking and start subscribing to Createquity. Led by Ian David Moss of Fractured Atlas, Createquity offers weekly(ish) long format posts on arts policy, research, strategy, and funding. Ian authors the blog alongside rotating "writing fellows" who bring diverse perspectives to the table (and make it possible to issue many thousands of words per week). In-depth analysis of arts research reports. Check out today's fabulous post from fellow Jackie Hasa about the new James Irvine Foundation-commissioned report on arts participation in California's Inland Empire. These posts tend to provide both a broad overview and unique insights into the meaning of new research. Every time I read one, I think "I should write about this research study too." And then I don't, because they did it so well at Createquity. A healthy dose of nerdiness. Like me, Ian is a former scientist, and he relishes the opportunity to apply mathematical rigor in the exploration and critique of arts research and policy. While I understand that it's not for everyone, I love the exhaustive and often technical way that he digs into topics. I also love his willingness to revisit past topics with more information, as he did after an internship at the Hewlett Foundation in 2008. Complex approach to topics I care about. Recently, the majority of Createquity posts focus on the topics of active arts engagement and creative placemaking. The posts share cross-discipline stories ranging from dance to classical music to public art. They are rigorous. And they generate some really interesting discussion in the comments. Ian and I are unapologetically "on the same side" in a broad sense, but he makes me realize there are additional angles and surfaces to these issues I hadn't noticed before. Honesty and directness. Createquity is verbose, but not circumspect. Ian and his compatriots write honestly from their own experience, and then they back it up with lots of data. Or they critique the data. Whatever their reaction to the inciting report or topic, they are authentic and clear in representing their perspectives. I often think their arguments are the best around when it comes to active arts participation, as long as your audience is willing to read long articles. Exposure to a broader arts world. I've lived in a museum bubble for a long time. I like having a resource that makes me more aware of what's going on with symphonies and public art and foundations. Createquity is a little heavy on the funding discussion, but the Around the Horn bullet list posts along with the longer essays help me connect with worlds beyond museums. It's a bit surprising to perceive that the American "arts" field is in as much of a bubble as the museum industry--perhaps even a smaller one. There is a very tight circle of names dropped on this blog and its relations, and I feel like Createquity is a good access point to their world. It also makes me wonder what other worlds are out there. Enjoy the blog, explore the archives, and let me know what you think. Hi, I'm Nina Simon. Let's talk. I design and research participatory, community-based institutions. 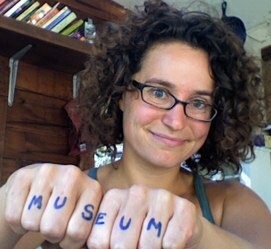 I'm the Executive Director of the Santa Cruz Museum of Art & History, founder/CEO of OF/BY/FOR ALL, and author of two best-selling books: The Participatory Museum and The Art of Relevance. Receive Museum 2.0 via email! I love to write and share. Warning: Museum Graduate Programs Spawn Legions of Zombies!